It was a delight to be in an English speaking country where you can interact with the locals. The sea here is gloriously warm. We had that Gibraltar feeling as we entered The Gambia. At last an English speaking country. We were greeted with "you are from England, you are home now". The people here are very proud of their British history. Again the formalities were fast and efficient but we were subjected to quite a thorough vehicle search. the mood was good and talk of Manchester's victory continued throughout the day. 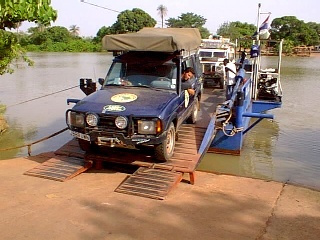 To reach the capital of Banjul it is necessary to take a ferry from Barra. The ferry leaves every two hours but only carries 2 cars and 2 lorries along with as many people as can be squashed on. It is possible for a lorry to wait up to a week to get across. Fortunately the tourist cars go straight to the front as they are of financial benefit. We just missed one ferry so we spent a couple of hours chatting to the local children. Andrew almost caused a riot by giving one boy a gift. Practically everyone else went berserk - they all wanted one! 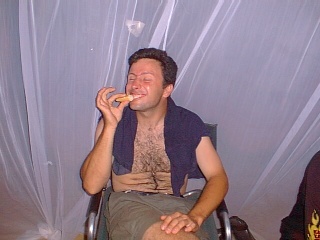 One of the chaps - Janko, is looking for a wife. He is 27 - any takers? He asked me to ask my friends if they would consider him as a husband (address can be supplied). Every child we met gave us a piece of paper with their name and address on it. They expect us to be their sponsors. It was so good to be in an English speaking country although it is quite difficult trying to understand the English spoken by the locals. At Banjul we headed straight for getting the formalities done. At the Guinee embassy we woke up the ambassador who was asleep on the sofa when we walked in. Thankfully he gave us visas there and then - for a fee, of course! Found a fantastic campsite - Camping Sukuta. It was like a haven and had a wonderful outdoor shower amongst the trees. At last, somewhere where we could camp properly. They had a restaurant and a kitchen area along with BBQ. Parked up alongside some Brits - Georgia and Richard from Brighton in their enormous truck. It took a long while to find some fellow countrymen and it was a pleasure to spend an evening with them. The campsite has a few pets. 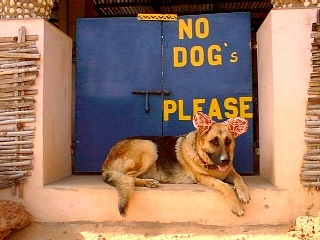 There is a viscious looking Alsatian called Tina who we renamed Mini Mouse as she wore colourful earmuffs during the day to keep out the mites. A scabby old dog visited us at every mealtime so we called him Oliver. One morning I was awoken by a cat on the other side of the tent mozi net. Don't know how the cat got up there as it is meant to be an animal-free zone. We called the cat "alarm-clock". We had planned a busy day to obtain Cote D'Ivoire visas and do some shopping but bad botties kept us in all day. Moving too far from the loo would have been dangerous! Chris arrived at the site that night. A Dutch chap on a Yamaha motorbike doing a solo trip through Africa. He told us of his adventures in Morocco - eating eyeballs; inflating sheep by blowing into the arteries of a newly slaughtered animal to make the chopping up a bit easier; wrapping intestines around kebab type things known as brochettes. Yuk, we had eaten brochettes before the bad botty episode! The next day another Landy arrived at the site. It was Noel and Sally who we had heard about in Morocco. We had expected them to be ahead of us but they managed to banana their chassis and front axle when they fell of the back of a sand dune in the desert. They had spent two weeks in St Louis getting their Landy, called Turtle, straightened. Suddenly there were six Brits at the campsite and it was time to party! We had heard that the local supermarkets stocked various imported goodies. Talk about "supermarket sweep" and "going wild in the aisles", it was incredible. We found bacon (buy 1 get 1 free), Heinz baked beans, marmite, chicken tikka ravioli, salsa pasta spirals, kidney beans, cheese (not vache qui rie), more marmite, Fray Bentos pie (thought of you, James), long life yoghurts, giant hot dogs, more marmite, peanut butter.....we were ecstatic. The crazy thing is that I would never buy most of those things in the UK. At home it's junk, out here it's cordon bleu. That evening we attended the highly recommended wrestling match. It is a two hour event where three teams of wrestlers with accompanying drummers prance around the audience for one hour and fifty seven minutes in the attempt of getting a few dalasi (5p). The wrestling itself lasts three minutes if you are lucky and just at the crucial moment the drummers block your view as they continue to circulate around the audience. What a load of rubbish. It is just another tourist tax. The arena had its fair share of wheelchair bound locals asking for money too. One chap had no hands and no feet. He shuffled around with flipflops strapped to his knees and carried a file in his arm stumps, which he passed to the toubabs to read. Inside the file there was a bit of paper with writing in various languages requesting money. It is a terrible thing but it took all my energy not to laugh - the poor geezer was saving up for an eye operation! As if he didn't have enough wrong with him. Anyway we left the wrestling arena and missed the fun. According to Chris some chap had been caught thieving and two dozen locals took turns to beat him up. Anything that has the potential to reduce tourism here is serious. The next evening there were six Brits and a Dutch man to be found in the supermarkets buying burgers, snags and a few crates of beer for a barbie. Smashing evening! 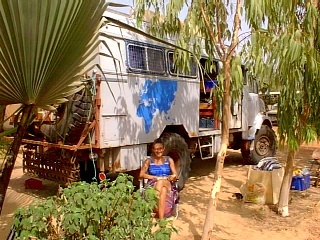 The following few days consisted of relaxing around the camp (ha, ha - chores galore), trips into Banjul to visit the markets and conduct paperwork. We were delighted to meet Harry in town with Ebrima - Mariams new husband. He arranged to visit us that night for dinner then failed to turn up. 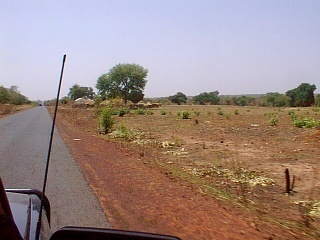 The town of Serrakunda near to the campsite was fantastic fun. It never closes and was full of street markets and activity. During siesta time though people stop doing whatever they were doing (very little) and go to sleep - under their lorries or in their wheelbarrows. It was fun being able to haggle with the locals for some very good bargains. Andrew helped Noel with some work on Turtle. The front axle was replaced along with the bushes then the gearbox had to come out for a cog replacement. What a major job and the help of Mr Farty (!) and his team was required. 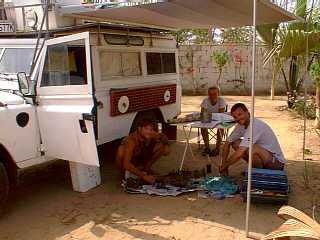 Taking a gearbox apart in the sand was quite a worry for Noel but all was well in the end. We had some work done on Punda by Trevor Bush at the SOS Camp as recommended by the Viking and Chief convoy. The exhaust pipe was welded along with the tea-strainer (more importantly) and the engine oil changed. Searched out Harry & Co and spent an evening with them. Harry had malaria - a good excuse for the stand up, we thought. He was not a well man at all. His truck has been turned into a travelling party machine with disco and food. Their plan is to serve various events. A few more delicious days followed - bacon butties, swimming in the gloriously warm sea. 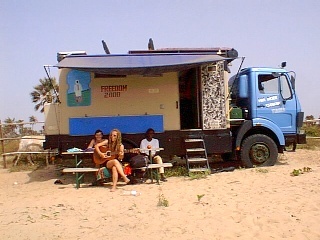 Tried to visit Wolfgang (of the desert convoy) at Badala Beach Bar a few times but failed miserably. Each time we were told "he's due any minute". That is African optimism for you, translated into "they haven't a clue". 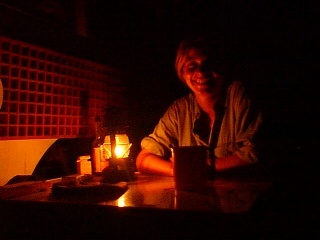 Had a BBQ with Georgia and Richard whilst we watched a spectacular lightening display in the distance for a couple of hours. Suddenly the storm was with us and it was "everybody panic". The wind howled and the rain just went whosh and soaked everything in seconds. Fortunately the tent survived. The next day we celebrated two months of travelling. 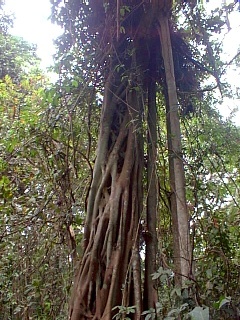 We all visited Abuko Nature Reserve - a rainforest area with monkeys and crocodiles. 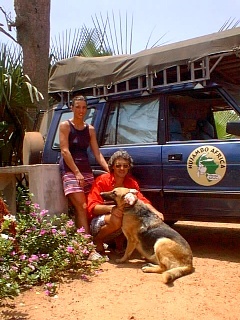 Later we took a pirogue trip up The Gambia River followed by a Yassa dinner at Lamin Lodge. Andrew and I took a scenic drive through various villages along the beach. Fish smoking houses were common and the town had that familiar l'odeur poisson. The village of Gunjor supplied us with tomatoes and fresh fish for 2 dalasi. We were delighted until we tried to eat them - bones galore, millions of them. It turned out that these are the fish that are dried and ground to make sauce. After "just one more shower" in the open air we were sad to leave the luxurious Camping Sukuta which had been home for longer than anywhere so far. We headed inland in convoy with Noel and Sally in Turtle. With the "rains" impending we planned to cross Guinee together. A diesel station tried to charge us for our fuel plus the fuel of the supervisors mate. The whole event was a bit odd but ended with the first ever African refund! 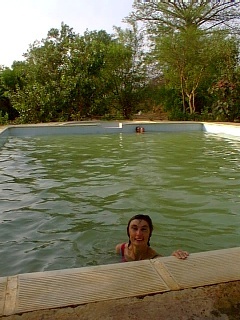 We spent the night at a fabulous location next to The Gambia River at the Kiang National Park. We thought that we were in for a relaxing G&T until two adolescent locals giving themselves senior titles turned up to see if they could extract more money out of us. We agreed that we would pay a quid for a half day tour the next morning. This make believe officialdom is becoming rather tiresome. It is also very sad because one cannot blame the locals for trying to make 50p here and there. The park was incredibly noisy that night and the tour quite poor. They directed us through some mud which gave Punda her first skating lesson. The road to Georgetown took us through village after village. There were more locals out than usual sitting under their mango trees and each one waved and smiled enthusiastically as we drove past. 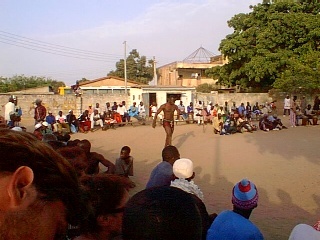 They were cheering and whooping, even dancing. At one village the school children lined the road and waved flags at us. We smiled and waved back as usual but this welcome was beyond expectation. It was only when we passed a banner saying "welcome Mr President" that we realised it wasn't meant for us. We were a few minutes ahead of the presidential convoy and the locals thought we were part of it. What a laugh though, it was so funny. I had read that Georgetown was an old colonial town that is now rather sleepy. It is on an island and I expected it to be like St Louis in Senegal. To get to the island one has to take a ferry. It was only when we reached the second ferry on the other side of the island that we realised we had driven through the town. Sleepy is an understatement - dormant more like. Found Bird Camp Safari where we eventually camped for three nights. It had a swimming pool where we could be found a great deal of time in the heat of the day with a few beers. The camp owner works for the UK cabinet office and told us a few interesting stories!!!!!! 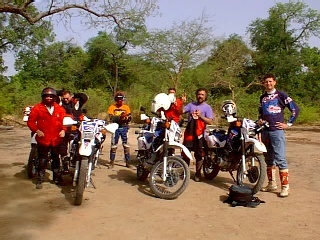 Chris turned up along with six other bikers from Germany. Wow, it's hot in the car with air-con. I would not like to be in full leathers on a bike in this weather. It is really, really, really hot now. I didn't know it was possible to be so sweaty and have moisture dripping off your eyelids. 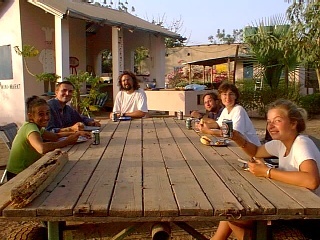 We were relieved one night when the sun dropped out of the sky (at 7.30pm) and the temperature fell to 38 degrees C.
On the 12th we left Georgetown, passed the bikers at Basse Santa Su and exited The Gambia - the first ever free border crossing - back into Senegal. Chris and Sally can't believe Noel can hold the landrover on his shoulders Bacon butties !! 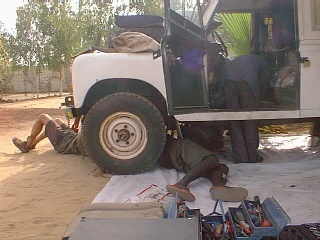 The gang doing a barbie Nice ear muffs Changing the gearbox African style. Where's Mr Farty ? Yassa is a big special dish and the chickens here are just as skinny as in Senegal. The local dish is "domodah" which is peanut (groundnut) stew. We tried chicken and vegetable domodah and it is fabulous. I will be making it when we return so beware (I will make you something different, Brian). There are mangos galore here and they are huge. Some are green, others orange. Apparently it depends upon the position on the tree. 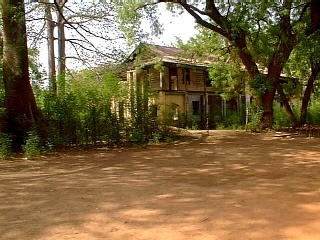 Under each mango tree there is a person so it is not possible to do the equivalent of scrumping here. Each mango costs about 5p and they taste fabulous. 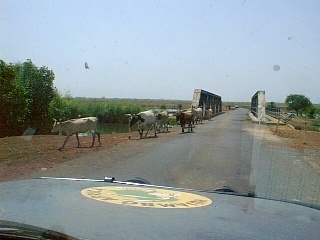 Banjul Around Serrakunda & Sukuta. Georgetown Southern Bank Highway through Georgetown and Basse Santa Su. 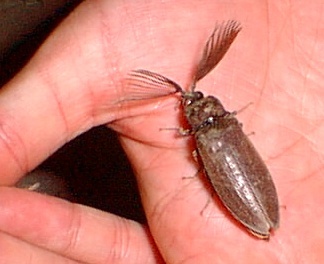 They speak English (in a fashion) so it is easy to take on battles. If an official causes problems (ie. tried to charge us for a visa extension) threaten to leave the country. They are so desperate for tourist money you can get what you want. 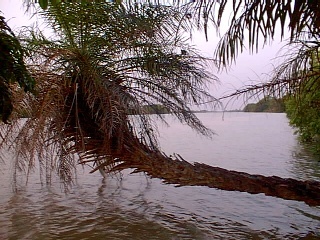 The Gambia has a 45 km coastline and stretches inland some 200 km following the course of The Gambia River. Apparently the border with Senegal is at a distance of where a cannonball could be shot from the river. The Gambia is land-locked by Senegal. 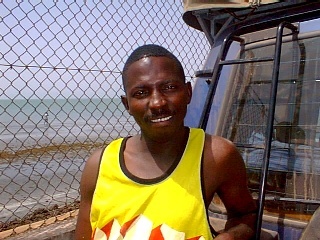 Gambian children who provide you with their names and address have a genuine hope that you will be their sponsor. I asked one what that meant and he replied that I had to send money and books for him so he could get through school. They would like footballs too! 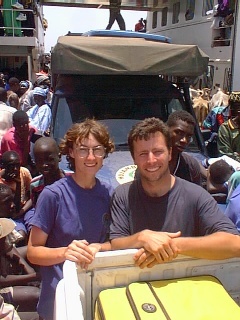 We have seen many people around West Africa who are crippled in some way or another. Diseases such as polio and leprosy have been mentioned but certainly limb disorders and visual disorders are prevalent. On a number of occasions we have stopped the car in the street for people who were crawling across the road - they have either flip flops or bits of car tyres strapped to their limb stumps for protection. 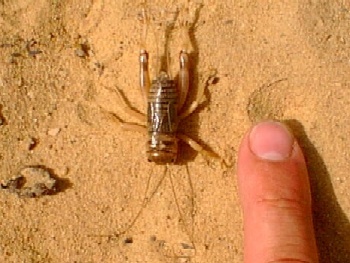 It is common for Africans to have one bout of malaria each season. Prophylaxis is generally herbal such as stewed papaya leaf tea. Medications for prevention similar to the ones we take are rare but medications for symptoms are commonplace. The Africans are experts on this disorder.